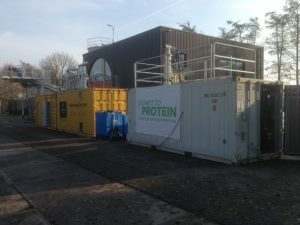 Two research pilots demonstrate that it is possible to safely use ammonium recovered at two WWTPs for the production of protein using a reactor in line with the Power-to-Protein concept: the chance that, with the recovered ammonium sulphate, pathogens from the wastewater cycle will end up in the protein is negligible. Nevertheless, the reactor concept has to be improved to ensure a larger transfer from the energy carrier hydrogen gas. Follow-up research has now begun for this purpose. In the Power-to-Protein concept, autotrophic hydrogen-oxidizing bacteria produce single cell protein (SCP) using hydrogen gas as the energy carrier and ammonium as the nitrogen source. The concept was tested in pilots at two WWTPs over the last year. The pilots used ammonium recovered from the wastewater cycle in the form of ammonium sulphate. This involved the use of existing technology, with air strippers and scrubbers applied to the liquid fraction of the sludge digestion at the two research sites. This was shown to provide a safe basis for protein production: the chance that with the ammonium sulphate pathogens from the wastewater cycle will end up in the protein was shown, using challenge tests with indicator organisms, to be negligible. The pilots also showed that the bacteria in the pilot reactor use the energy carrier hydrogen gas. Follow-up research is therefore needed to improve the reactor concept, so that a better transfer of gases to the microorganisms in the reactor takes place – and of hydrogen gas in particular. In the pilots the reactor produced an average of only 0.5 kg of SCP per m³ per day, instead of the expected 1.7 kg. A follow-up project has now been launched within TKI Water Technology in order to study the basic processes of hydrogen transfer in bioreactors and, on this basis, to improve the reactor concept. This is needed to make the concept economically viable and to produce protein of good quality. In parallel with the technological research, project partners Avecom and Allied Waters are jointly exploring the market uptake possibilities. The origin of the ammonium strongly determines the application possibilities: animal feed (ammonium from waste streams) versus human food (industrially produced ammonium). Power-to-protein and ammonium recovery pilots at Waternet’s Horstermeer WWTP.